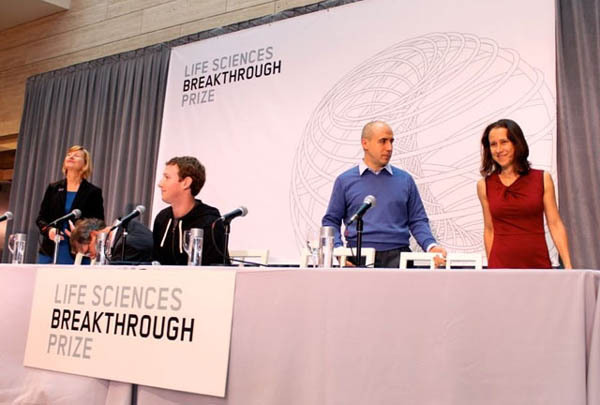 Mark Zuckerberg is lending his name and fortune to support developments in life sciences. He and his wife, Priscilla Chan, join Google co-founder Sergey Brin, Brin’s wife Anne Wojcicki, and famed venture capitalist Yuri Milner as founding sponsors of the Breakthrough Prize in Life Sciences. The prize, a $3 million financial reward, will be given out annually to scientists working to cure complex diseases. This year, 11 scientists each received the prize. “I am delighted to announce the launch of the Breakthrough Prize in Life Sciences and welcome its first recipients,” said Art Levinson. “I believe this new prize will shine a light on the extraordinary achievements of the outstanding minds in the field of life sciences, enhance medical innovation, and ultimately become a platform for recognizing future discoveries. “We are thrilled to support scientists who think big, take risks and have made a significant impact on our lives. These scientists should be household names and heros in society,” said Anne Wojcicki. “Curing a disease should be worth more than a touchdown,” said Sergey Brin. “Solving the enormous complexity of human diseases calls for a much bigger effort compared to fundamental physics and therefore requires multiple sponsors to reward outstanding achievements,” said Yuri Milner. Cornelia I. Bargmann: For the genetics of neural circuits and behavior and synaptic guidepost molecules. David Botstein: For linkage mapping of Mendelian disease in humans using DNA polymorphisms. Lewis C. Cantley: For the discovery of PI 3-Kinase and its role in cancer metabolism. Hans Clevers: For describing the role of Wnt signaling in tissue stem cells and cancer. Napoleone Ferrara: For research on telomeres, illuminating how they protect chromosome ends and their role in genome instability in cancer. Titia de Lange: For discoveries in the mechanisms of angiogenesis that led to therapies for cancer and eye diseases. Eric S. Lander: For the discovery of general principles for identifying human disease genes and enabling their application to medicine through the creation and analysis of genetic, physical and sequence maps of the human genome. Charles L. Sawyers: For cancer genes and targeted therapy. Bert Vogelstein: For cancer genomics and tumor suppressor genes. Robert A. Weinberg: For characterization of human cancer genes. Shinya Yamanaka: For induced pluripotent stem cells. restriction, and past winners can win again.